Precipitation during September so far has ranged from less than half-inch to more than 3 inches. 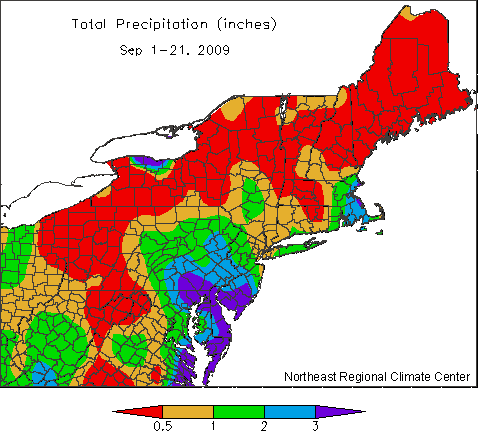 If you were tired of the rainy summer of 2009, welcome to September! As shown above, the region has seen very little rain during the first month of autumn. The areas with the most rain through the 21st received the bulk of those totals between the 10th and 12th - the rest of the month has been extremely dry. At this time, there are no drought concerns and a return to below normal temperatures should keep fire hazards low.